What better way to celebrate back-to-school season than with new kicks? And what better partner for Bellerose to collaborate with than Veja? When Veja launched its debut collection some 14 years ago, Bellerose was their very first wholesale customer. Seeing how both brands value craftsmanship, authenticity and durability, we've always felt like a collaboration would make all the sense in the world. This project resulted in two exclusive models of shoes that were designed by Bellerose’s Derek Van Heurck. He opted for bold, lively colors on the classic V10 model for adults and a Velcro version for kids. To celebrate, we also got in touch with four super talented and exciting illustrators and asked them to send us their vision of this collaboration. We gave them carte blanche, the only rule: the illustration needed to fit on an A3 sheet. Our first illustrator is Léopoldine, a graphic designer who also happens to have a soft spot for illustration. She runs her own creative studio in Paris as well as a magazine called Papier. We got to spend time with her at her new studio right after they had moved in and embraced the chaos! Her passions? Soccer, the Kardashians and the environment. She was already a Veja fan when we got in touch and was happy to learn more about Bellerose. "What I like most about Veja is their positioning. I like the fact that they want their production to have as little impact as possible on our planet, and that's something I wanted to address with my illustration. I drew inspiration from their website as it explains their way of producing their shoes in a very clear way and decided to illustrate that. I drew a man washing cotton, another one who's washing some kind of fabric. And, lastly, I illustrated a Bellerose x Veja photoshoot. Did you notice the models are wearing Bellerose socks? The devil’s in the details." 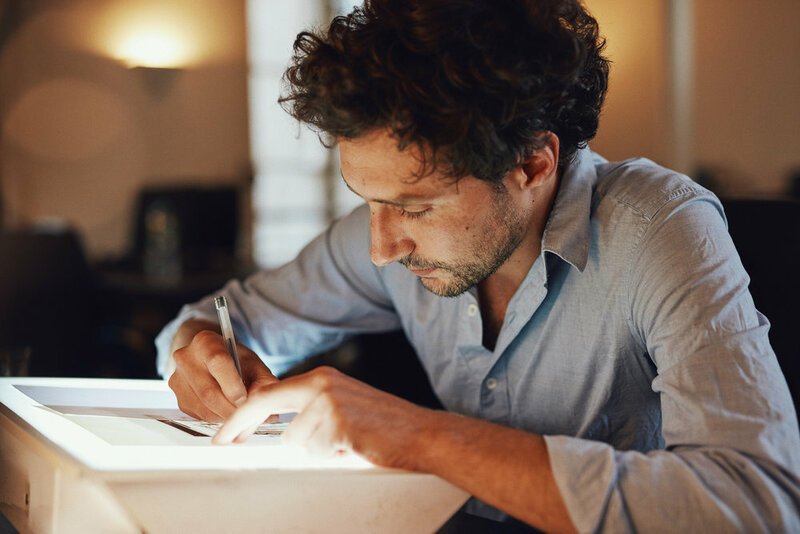 Working in both motion design and illustration, Kevin literally never stops drawing. He showed us his sketchbooks and they simply took our breath away. 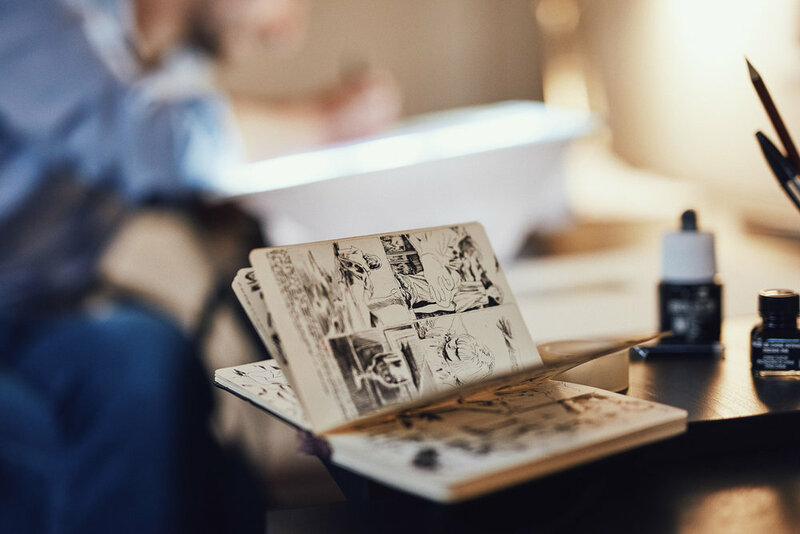 His realistic drawing style means he often works for press outlets, but comic books are his first inspiration, though he's never published a comic (yet). Coming from the Gobelins, most of his friends draw, too, and they usually just spend time drawing together. Through his illustration, he wanted to pay homage to three core concepts from our collaboration that caught his attention: travel, nature and ecology. He decided to base his illustration on comic books and collage, all while making sure to keep the spotlight on the shoe itself. "These three values that both brands share are so beautiful and universal that I found it challenging to come up with something original. I created a mini-comic with a sort of narration. I think the pages of comic books could often be standalone illustrations. The result is a collage-inspired illustration that tries to combine the values of Bellerose and Veja. I picked hairs floating in the wind, natural landscapes, wood... And also decided to include both brands' logos as well as, of course, the shoe!" Kristina is a Belgian artist, based in Liège. Her illustrations always draw inspiration from photography and videography as a way to capture reality. We hung out with her at her mother's apartment, as she was in between places when we had planned to see her. Her 9-month-old baby was present too and we had a great time diving into her day-to-day life while learning about her world. Her work aims to convey emotion and is uniquely poetic. A quiet person herself, she is inspired by vulnerability, intimacy and contemplation, and that's what the illustration she made for our collaboration also brilliantly showcases. "I was really excited to work on this Veja x Bellerose collaboration. I love the universe of both brands and found this project very inspiring. I wanted to tell a story with my illustration. I like narrating a moment in life and trying to tell this story using just one image instead of a single illustration. My goal here was to depict a moment of joy, freedom and insouciance." Our last (but not least) illustrator is Florent Pierre. He's part of art direction, motion design and graphic design duo and agency Pierre Pierre and works in Paris. 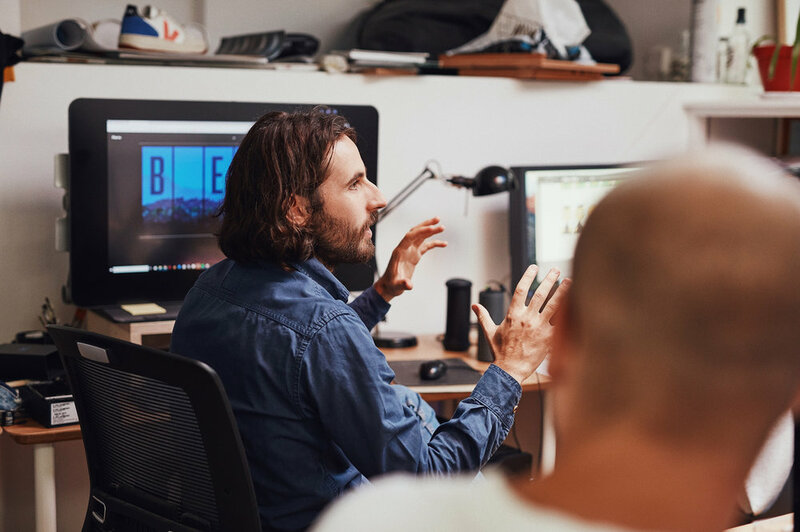 We met up with him in their small office where he and his four coworkers were hard at work, planning projects for clients from the fashion, art and media industries. We’d worked with Florent before on several different illustration projects, and including him in this one seemed obvious for us. 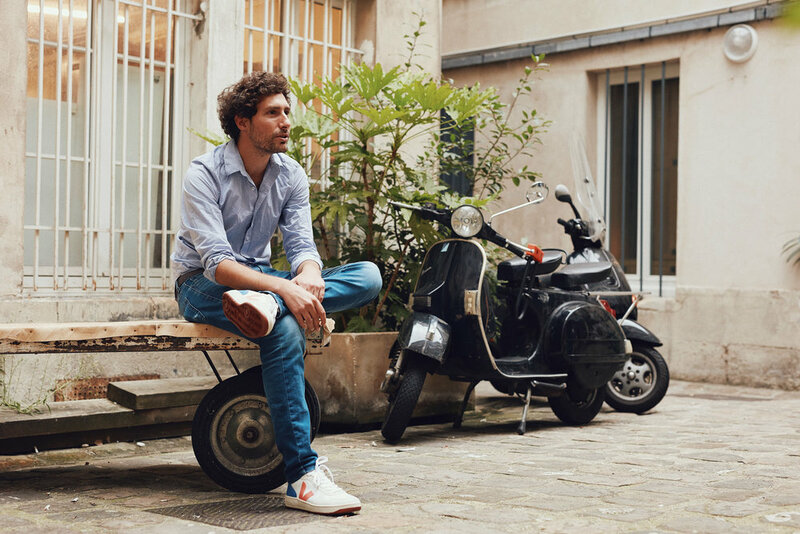 Though Florent was familiar with Veja, he decided to take a close look at their story before getting started and was touched by their focus on craftsmanship. "My father is a winemaker and works with cooperatives, just like Veja does. This direct connection to nature reminded me of my childhood. I could picture kids climbing up rubber trees in the area where Veja shoes are made. That's why I decided to draw something by hand, using just a brush and India ink. This added some pressure because you can't mess up! I'm not used to using this technique and that made me get out of my comfort zone." Thanks again to Léopoldine, Kevin, Kristina and Florent for their artwork and time.